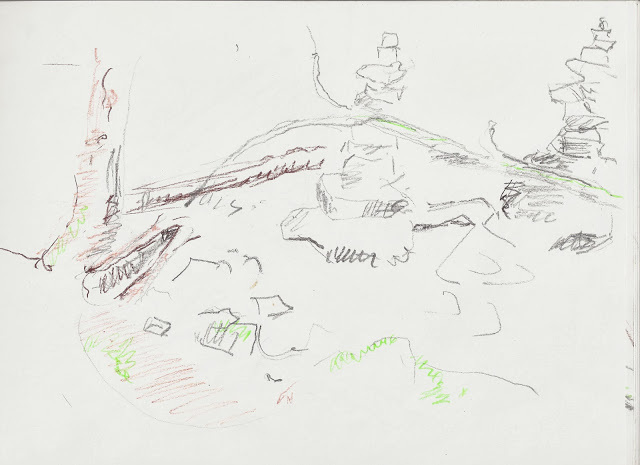 What’s the difference between a drawing and a photograph in rendering experience? In On Photography Susan Sontag writes about the photograph appropriating the object and becoming more real than the object itself. I spent Labor Day camping in a nearby wilderness area. On a whim I took the sketch pad and pencils along with my Android phone. I usually leave the phone in the car, preferring my solitude without actual or virtual interruption. I camped in a small field off an old logging road. As I set up camp, I found I brought the fly and body from two different tents, so I rigged up the fly by itself with the poles. When I went to start my stove, the pump leaked. (Thanks, MSR). So I built a small fire to cook the salmon I bought along and boil water for Ramen noodles. As I finished eating, a thunderstorm rolled in. I crawled under the open fly and put the tent netting over me to keep out the bugs. I fell asleep to the flash of lightning and rain pouring down. Next morning I woke to mist on the field but no rain. I found some fairly dry standing dead-wood under the trees. With the help of a little stove fuel, I built another fire and made coffee and breakfast. As sun burned the mist off and dried the grass, I folded my disparate tent parts. Rusted fencing surrounded the trunks of several trees in the field. 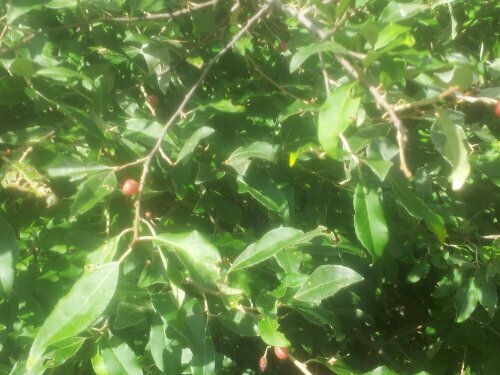 One gnarled specimen with leaves like a cherry had small iridescent red berries on the branches. I grabbed my pad and made a sketch of it, then took a photo with my phone. I looked this up in Thoreau’s Wild Fruits . 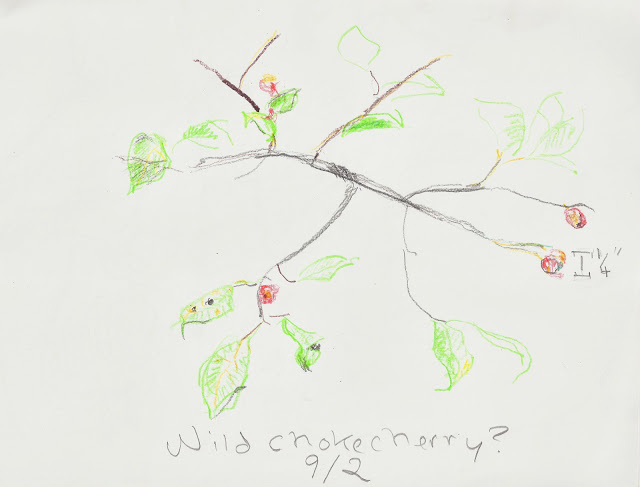 The closest I came was chokecherry, but I’m not sure that’s accurate from my previous experience. I spent about least twenty minutes making a sketch and adding some color, before getting impatient. I’m an amateur artist, and a photograph takes just a few seconds. If what you are looking for is an exact representation or facsimile of what is seen, a drawing (at least mine) will always come up short. 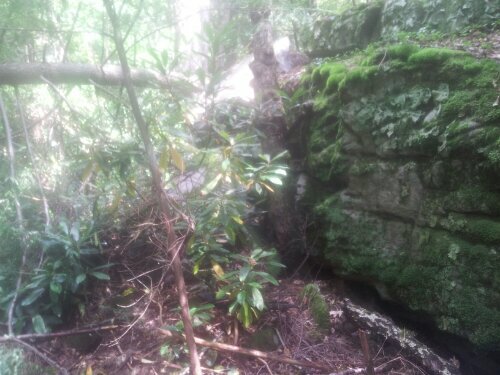 On my return, I walked along a rock face beside the trail with a tree growing from it. I stopped to make a sketch, then took several photos. The static image is snatched from the ebb and flow of life. A person or object comes into view; we point and shoot. The next day or years later (examined perhaps by strangers), the photograph is isolated from context and experience, dependent on memory or meaning imposed by the viewer. Digital photography and other forms of replication seduce us into capturing and sharing experience indiscriminately, without even knowing its significance. 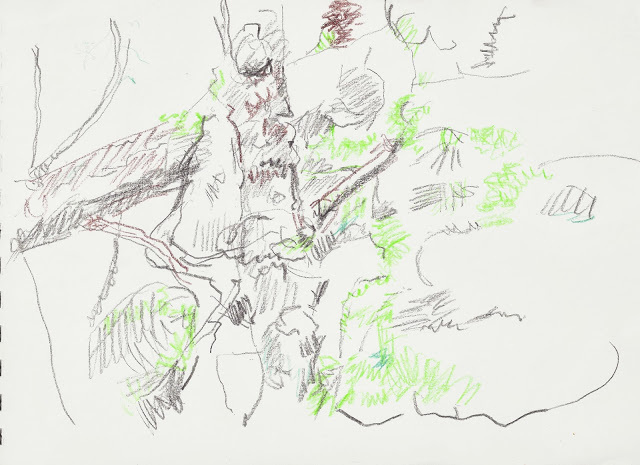 Drawing (or painting or sculpture or music) requires an artist attending mindfully and working within the limits of his or her skill and perception in conveying a representation of light and color, structure and space, tonality and rhythm. Film captures both sound and motion. Artfully arranged, these render experience that reflects (or projects) what we desire to see as much as what exists. Encountered immanently (up close and personal) with all its flaws and vicissitudes (bugs, smoke, missing tent parts and failed fuel pumps), the real often proves inferior to the image. Ask anyone who has seen a Disney nature film or met a movie star or celebrity in person. Our own expectations and others’ of how life works are set more and more by the artificial (and wholly unrealistic) criteria set by others’ imagination. Technically, you are not supposed to alter or leave anything behind in the wilderness where I camped. 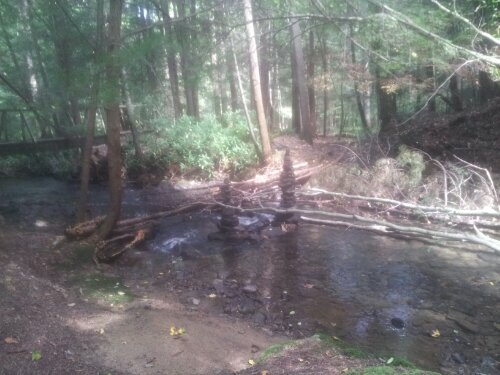 Someone built a couple of rock towers (cairns) in the middle of the stream. I puzzled a bit about how to suggest water flowing in drawing these. I finally added a couple of curved lines to suggest ripples. Does it work? I’m sure a practiced artist wouldn’t think twice about this. Behind me in the image was a good-sized fire circle. I use existing ones myself sometimes when camping. I don’t really mind them unless someone cluelessly (or deliberately) leaves glass, cans bottles and other items behind. The Pennsylvania Conservation Corps built a number of wooden bridges on the trails in the 1990s. The bridges bounce a little and creak when you walk on them. They smell like old wood and creosote. Your footsteps sound hollow when you walk across. At high water you can hardly hear because of the rushing of the stream beneath.